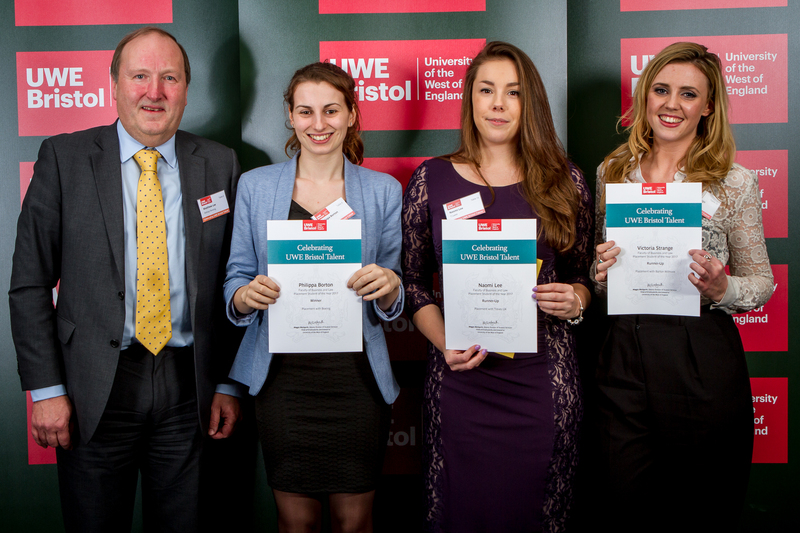 Every year, UWE Bristol celebrates their students and alumni with the Celebrating UWE Talent Awards. This year, the Bristol Business School and Bristol Law School won more awards than any other Faculty by winning in five categories and also having five runners up. Firstly, Heather Murray, a student on BA Marketing degree, won the Undergraduate Intern of the Year award for an internship at St Werburghs Community Farm. The citation from her employer noted that during the internship she became fluent and confident in writing licence and funding applications, together with communicating excellently with a wide range of people. The Entrepreneur of the Year Award was won by Rob Wilson, Will Dooley and Bradley Green founders of Crowdreach, a business started whilst they were students on the Business (Team Entrepreneurship) programme. This start-up business delivers a Crowd Funding service and has delivered on over 30 projects, with one project raising 1 million dollars. Next up, the winner of the Social Entrepreneur award was Neha Chaudhry, a graduate of the MSc Marketing degree, who developed a walking stick which assists sufferers from Parkinson’s disease. Neha used her social enterprise as material for a number of her assessments on the MSc Marketing programme. Philippa Borton, a final year student on BA Business and Management, won the Bristol Business School and Bristol Law School Placement Student of the Year for a placement at Boeing Defence UK. Her employers commented that she provided market analysis on a range of multi-billion pound campaigns, receiving formal recognition from executives in the UK and the US and making a valuable contribution to the business. She is currently working on a dissertation for which she collected the data whilst on placement and continues to work part-time for Boeing. Philippa has been offered a full time position with Boeing when she graduates. Finally, Sagar Limbu, an alumnus of the BA Business and Management and now a student on the MSc International Management, was a winner of the UWE Bristol Futures Award Student of the Year and a runner up in the International Experience Student of the Year category for an internship in China with Generation UK. Arian Ali Ghanbari, from BA Business (Team Entrepreneurship) was a runner up in the Social Entrepreneur category for Solarnest. Arian used a UWE Enterprise grant to take part in the self-employed internship programme, building Solarnest’s brand, awareness and social media following. Angharad Griffiths, an LLB Law student, was the runner up in the Undergraduate Intern category for an internship with Coull Ltd, who noted that she was ‘focused, efficient and always on time’ and that they are offering her a part-time role within the company. The two runners up for the Bristol Business School and Bristol Law School Placement Student of the Year were Victoria Strange from BA Business Management with Law for a placement as Business Development Co-ordinator with Barton Wilmore and Naomi Lee from BA Business Management (Leadership, Change and Organisations) for a placement as Project Support Co-ordinator with Treves UK. Congratulations to all the students and alumni who won and nominated at the awards!